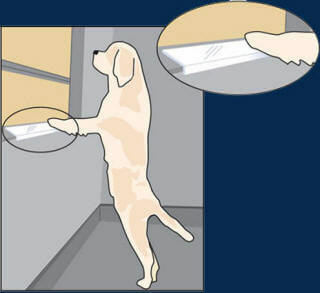 Dogs love to look out the window – whether it's at you coming home or another dog walking by. This may help them from being bored in the house but it wreaks havoc on the window sill. Sill Shield™ window sill covers are a simple, inexpensive way to protect your sill from paw damage. I also have the strongest door protectors on the market. Choose white or clear to match your décor. Standard sizes are priced from just $11.99 to $15.99. Our window covers are available in a variety of standard sizes (see the chart below). For longer sills, just line up as many as you need. 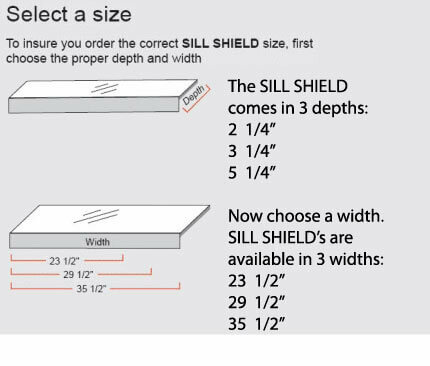 If none of the standard sizes work for you, I can create a custom shield (maximum size 35.5 inches long x 5.25 deep). If you have a crank on the sill, notching are also available. 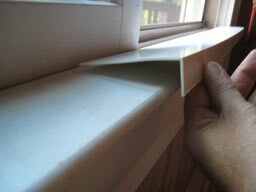 Sill Shields and door shields are easy to install and remove. Simply attach them to your window sill with peel and stick 3M Dual Lock Coins (included). Place Your Shield order ONLINE, BY MAIL, or over the PHONE today! Window Sill Covers? Windowsill Covers?? Window Stool Covers?! That's right. Technically, the inside ledge of a window is called the window stool. The outside ledge is the sill, but trying to sell something called a "stool shield" just seemed like a really bad idea. I grew up in a house full of dogs. My father was a breeder/trainer/shower, vice-president of the Rockland County Kennel Club and the first President of the Dalmatian Club of Greater New York. We used to tease him that if anyone saw the way his obedience champions acted out of the ring, they would come and take the trophies back. I started my plastics engineering career over 30 years ago and soon after started sharing my home with an assortment of four legged roommates. Throughout my life I had gotten used to the damage pets can do and when I finally became a homeowner I did my best to pet proof my house. One product I desperately needed was something to protect my window ledges from paw damage. I started looking in catalogs and on the internet but I couldn't find anything. I shamefully admit that it took me quite a while before I said to myself, "You're a plastics engineer...make something!". I played around with a variety of ideas but the big problem that I faced was that there is no standard for window sills. I realized that I would have to keep the design simple so that it would work in most any situation. After some prototypes were made and tested, Sill Shields™ were nearly ready for the public. Now the question was how to attach it to the wood securely but without the need to drill holes. I got in touch with 3M, the guys who make Post-Its and Scotch Tape, and they sent me these cool round interlocking things they call Low Profile Dual Lock Coins. They hold great and were easily removed without causing any damage. In 2006, I got a trademark for the name SILL SHIELD™ and had a website made so I could offer my product to others. By popular request I added a door shield in January 2008. My amazing Velcro leash reflectors came 2 years later. And of course, I have other projects in the works. -Gary Castelle, owner, Magnum Plastics Inc.